Lithium containing aluminum alloys have become attractive candidate materials for aircraft structural applications because of their superior properties such as reduced density, improved elastic modulus, higher specific strength, enhanced resistance to fatigue crack propagation and superior strength-toughness combinations at cryogenic temperatures. However, progress in the realization of their potential has been inhibited by their limited ductility, inferior low cycle fatigue resistance and low fracture toughness. Attempts have been made to improve fatigue and fracture resistance of these alloys by resorting to lower strength levels. Increasing payload and fuel efficiency of aircrafts has become a major issue for the aerospace industry, which has boosted the development of more advanced materials with high specific properties. 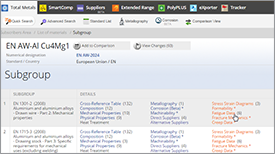 Among the candidate materials is the new generation of low density Li-Al alloys. These low-density alloys are attractive to the aerospace industry, since structural weight reduction is a very efficient means of improving aircraft performance. Modern Al-Li alloy development is motivated by prospective weight savings owing to decreased density and increased stiffness as compared with conventional alloys. Improvements in density and stiffness are joint consequences of lithium additions. The marriage of Li to Al offers the promise of substantially reducing the weight of aerospace alloys, since each 1 wt.% Li added to Al reduces density by 3% and increase in elastic modulus by 6%. Al-Li alloys use in aircraft applications, where the weight savings effected by using these low-density alloys greatly reduce the vehicle fuel costs and increases performance. In contrast to new materials systems such as fiber-reinforced composites, low density Al alloys do not require large capital investments by the aircraft producer in new fabricating facilities. This cost savings can more than offset the greater performance increment, which composites may offer, resulting in Al-Li alloys being substantially more cost effective than composites in some applications. Lithium containing aluminum alloys have become attractive candidate materials to replace the traditionally used 2XXX- and 7XXX series aluminum alloys for aircraft structural applications because of their superior properties such as reduced density, improved elastic modulus, higher specific strength, enhanced resistance to fatigue crack propagation and superior strength-toughness combinations at cryogenic temperatures. Fatigue crack growth resistance in Al-Li alloys generally is very high; this is important in damage-tolerant structures such as lower wing surfaces. However, progress in the realization of their potential has been inhibited by their limited ductility, inferior low cycle fatigue resistance and low fracture toughness. Attempts have been made to improve fatigue and fracture resistance of these alloys by resorting to lower strength levels. One such option is to choose an under-aged temper, in which condition these alloys possess higher fracture resistance as compared to that of the peak-aged condition and, hence, a strength-toughness combination comparable to the traditionally used aluminum alloys. Prasad and coworkers have demonstrated that though the under-aged Al-Li 8090 alloy possesses higher mode I fracture toughness, its resistance to fracture under shear loading, either in mode II (in-plane shear) or mode III (anti-plane shear) or even the combined tensile and shear loading, i.e., mixed-mode I/III, is significantly inferior to that of the peak-aged alloy. Such effects of aging on the low cycle fatigue properties of Al-Li alloys are not yet understood. The low cycle fatigue studies conducted on these alloys till date are limited to the effects of alloying addition, degree of recrystallisation and directionality in properties. Lithium in small amounts allows the precipitation strengthening of Al when a homogeneous distribution of coherent, spherical δ´ (Al3Li) precipitate is formed during heat treatment. Like other age-hardened Al alloys, Al-Li alloys achieve precipitation strengthening by thermal aging after a solution heat treatment. The precipitate structure is sensitive to a number of variables, including, but not limited to, the quenching rate following the solution heat treatment, the degree of cold deformation prior to aging, and the aging temperature and time. 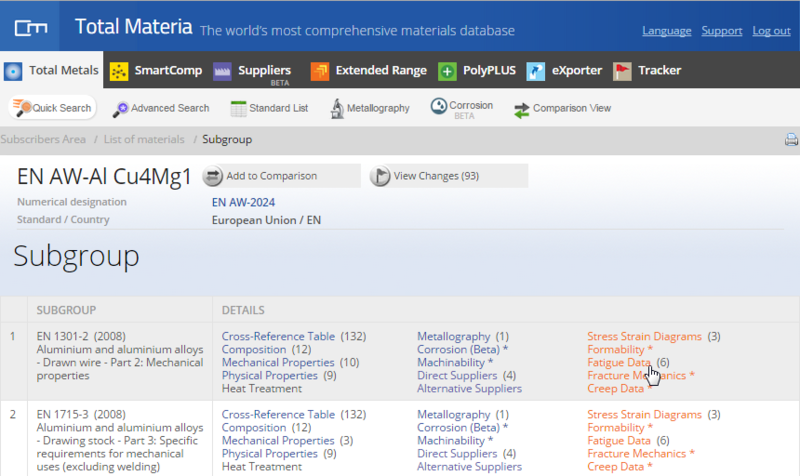 The 8090 type Al-Li alloy displays a microstructure consisting of metastable phases such as δ´ (Al3Li), S´ (Al2CuMg), T1 (Al2CuLi) and β’ (Al3Zr) within the grains. In addition several other constituent phases such as T2 (Al6CuLi3), δ (AlLi) and impurity phases occur at grain boundaries. Another important microstructural feature is the presence of a δ´-PFZ near the high angle grain boundaries. Fully reversed, total axial strain controlled low cycle fatigue tests were conducted on aluminum-lithium alloy plate of AA8090 composition in underaged (UA, T3) condition at strain amplitudes ranging from 0.0045 to 0.015. 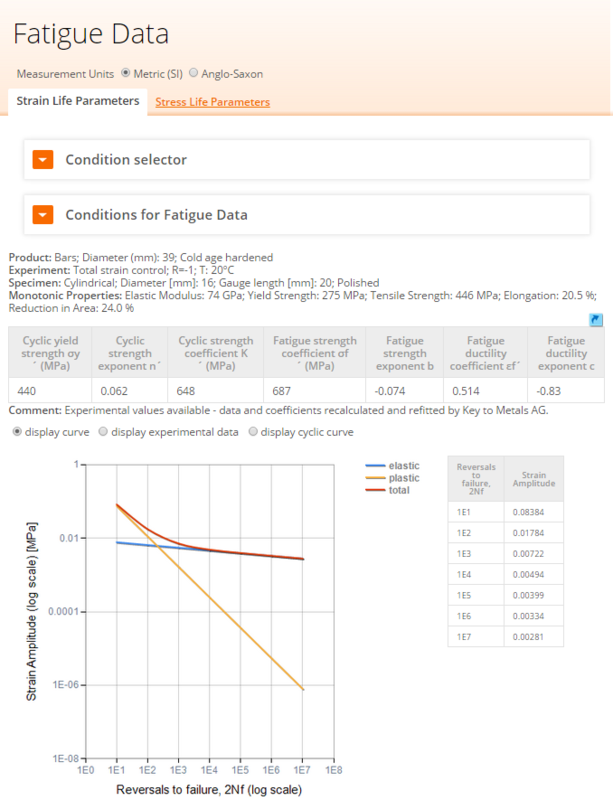 The properties studied include cyclic stress response behavior, cyclic stress-strain data and fatigue life variation with plastic strain amplitude (Δεp/2), average stress amplitude (Δσ/2) or average plastic strain energy per cycle (ΔWp). 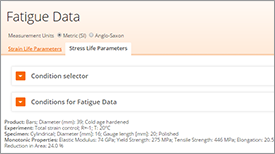 The fatigue data obtained for the underaged alloy have been compared with those of a peak-aged (PA, T8E51) temper alloy plate of similar composition. The alloys in the two ageing conditions exhibit similar cyclic stress response behavior, which varies with applied strain amplitude. Initial cyclic hardening was followed by cyclic stability till fracture at lower strain amplitudes, while cyclic softening followed initial hardening at higher strain amplitudes. 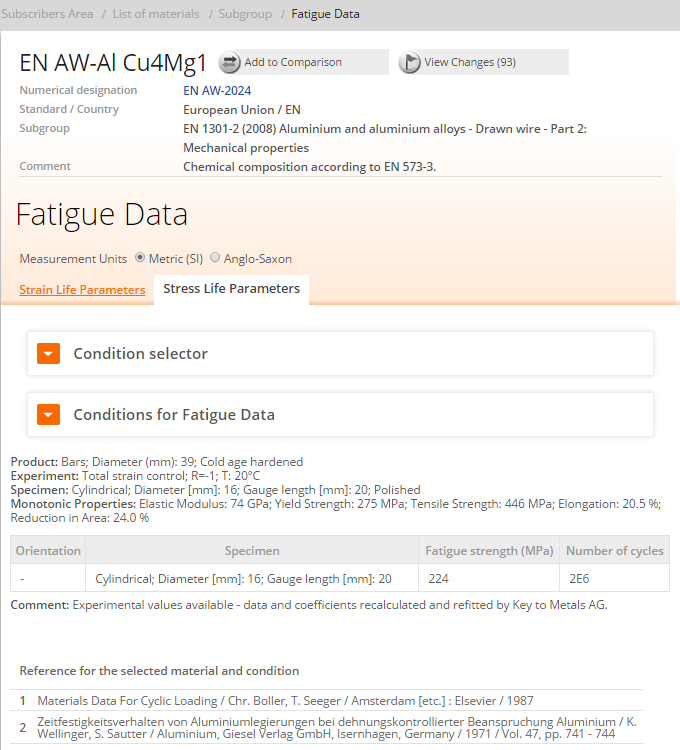 A comparison of the fatigue life data of the two alloys reveals that the underaged alloy possesses lower fatigue resistance than the peak-aged alloy. The UA alloy exhibits bilinear fatigue life power-law relationships with power-law constants at lower strain amplitudes being higher than those at higher strain amplitudes, in a manner similar to that reported earlier for the PA condition. The observed transition in the fatigue life power-law relationships is attributable to changes in the deformation and/or deformation-assisted fracture modes. Fully reversed, total axial strain controlled LCF tests were conducted in laboratory air atmosphere at room temperature. The initial cyclic hardening observed in the first few cycles, at all strain amplitudes, might be attributed to the increase in dislocation density and to the increased degree of dislocation-dislocation interactions as well as interactions with the dispersoid particles and strengthening precipitates. The increase in dislocation density as well as the extent of dislocation interactions increases with increase in strain amplitude resulting in higher extent of cyclic hardening. Higher extent of initial cyclic hardening in case of the UA plate as compared to the PA plate is attributable to higher work hardening capability of the alloy plate in the underaged condition as revealed by the uniaxial tensile properties. The cyclic stability followed by the initial cyclic hardening, occurring mostly at lower strain amplitudes, is attributable to stable dislocation structure, especially a constant dislocation density in the form of nearly the same dislocation cell wall size and their thickness with elapsed fatigue cycles. The cyclic softening observed in the case of alloy AA 8090 composition in both UA and PA conditions can be attributed to the shearing of δ’ precipitates, the major strengthening phase of the alloy. The alloy fails by transgranular shear fracture with distinct fatigue striations at strain amplitudes below the transition. The crack extension at these strain amplitudes occurs with plastic intrusions and extrusions leading to predominant fatigue striations. With increase in strain amplitude, the fracture mode gradually changes to a relatively lower energy mixed mode fracture morphology comprising quasi-cleavage or faceted fracture with isolated regions of microdimples. Hence, in case of the UA alloy, the fracture at both lower and higher strain amplitudes is predominantly governed by the intragranular microstructural features of the alloy (especially the major and minor strengthening precipitates). Fracture mode at intermediate strain amplitudes (near-transition) is mixed comprising both transgranular shear fracture and quasi-cleavage/faceted fracture with transgranular microdimples. In view of the above observations, the transition in the fatigue life power-law relationships is attributable to the change in fracture morphology with applied strain amplitude. The results of experiments conducted have shown that the damage tolerant Al-Li sheet alloys 2091 and 2090 possess acceptable fracture toughness, crack resistance, constant amplitude fatigue crack growth properties (with and without occasional peak loads) and corrosion and stress corrosion resistance, as compared to conventional alloys like 2024-T3. At yield strengths > 325 MPa the Al-Li sheet alloys become increasingly less fracture resistant than conventional 2000 series alloys. Texture effects on properties should be minimized by recrystallization, which is not easy to achieve in gauges beyond 2 mm. Al-Li sheet in nominally damage tolerant tempers may be sensitive to dynamic effects on crack resistance. This means that fail-safe crack arrest properties must be investigated, using stiffened panels typical of aerospace structures. Under gust spectrum loading the long fatigue crack growth behavior of the Al-Li sheet alloys is significantly inferior to that of 2024-T3. This means that Al-Li applications could be restricted to fuselage structural areas whose load histories resemble constant amplitude loading with or without occasional peak loads. Besides the typical damage tolerance properties, fatigue durability is essential. In fact, durability is probably the most critical test of the ability of damage tolerant Al-Li alloys to replace conventional materials. Durability means in practice the late occurrence of widespread cracking at fastener holes in aerospace structures. In this respect the short fatigue crack growth properties are of primary importance. 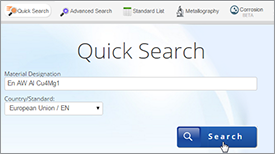 The available information on short fatigue crack growth in Al-Li and conventional alloys indicates that growth rates under constant amplitude and gust spectrum loadings are comparable. But more definitive data are needed for comparing damage tolerant Al-Li and conventional sheet alloys. Stable and unstable crack growth in 2091-T8X, 8090-T81 and 2024-T3 occurred in the slant mode typical of ductile, plane stress fracture. The fractographic characteristics were also ductile (microvoid coalescence and shear walls) except that unstable crack growth in 2091-T8X was 50 % intergranular. 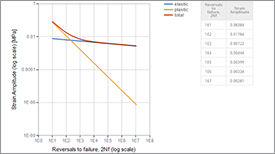 The 2091-TX and 2091-TY alloys failed anomalously. Stable crack growth (if any) was slant with extensive plasticity, but unstable crack growth was macroscopically flat and brittle. This change was accompanied by low fracture toughness, low crack resistance and a transition from ductile transgranular fracture (microvoid coalescence and shear walls) to 100 % intergranular fracture. Also, crack jumping followed by temporary crack arrest was characterized by intergranular fracture changing to ductile fracture. The observations suggest that 2091-TX and 2091-TY were sensitive to dynamic effects, such that higher strain rates ahead of crack tips resulted in increased yield stress, a change from fully ductile to intergranular fracture, and inferior crack resistance. This implies that a material like 2091-T8X, which showed a change from fully ductile stable crack growth to 50% intergranular unstable crack growth, could have a dynamic fracture toughness Kd much lower than the quasi-static fracture toughness Kc. Thus although 2091-T8X had acceptable Kc values and resistances to slow, stable crack growth the failsafe crack arrest properties could be much inferior to those of 8090-T8l and 2024-T3. The Al-Li alloys of AA 8090 composition in the underaged (UA, T3) and peak-aged (PA, T8E51) temper conditions show similar cyclic stress response behavior, which varies with applied strain amplitude. Cyclic hardening in the initial few cycles is followed by cyclic stability at lower strain amplitudes and cyclic softening at higher strain amplitudes. The alloys exhibit bilinearity in the fatigue power-law relationships with a clear transition. The underaged alloy is characterized by a single CSS power-law relationship, while the peak-aged alloy showed distinct change in the cyclic work hardening behavior with higher n' value at lower strain amplitudes as compared to that at higher strain amplitudes. The underaged alloy showed inferior low cycle fatigue resistance as compared to the peak-aged alloy. The low LCF resistance of the underaged alloy is attributable to the combined effects of lower degree of unrecrystallised grain structure, lower content of S' precipitates and finer size of d' precipitates. The transition in the fatigue power-law relationships is attributable to the changes in the fracture morphology. The alloy in the underaged temper exhibits higher energy transgranular shear fracture with fatigue striations at lower strain amplitudes. With increase in strain amplitude, the fracture mode changes to a relatively lower energy quasi-cleavage/faceted fracture with microdimples.